Since turning in my manuscript revision for my first full-length book last month, I’ve been resting. I sleep in until the alarm clock goes off. I don’t check e-mail on weekends. I take naps during episodes of the West Wing and don’t bother to rewatch them before moving on to the next one. I even managed to take my publisher’s advice to “consider the electronic copy of your manuscript dead to you.” Until now, when people asked about my book – off in some faraway copy editor’s hands – I replied, almost zen-like, “I feel a certain peace about it.” Writing for fun seemed possible again. 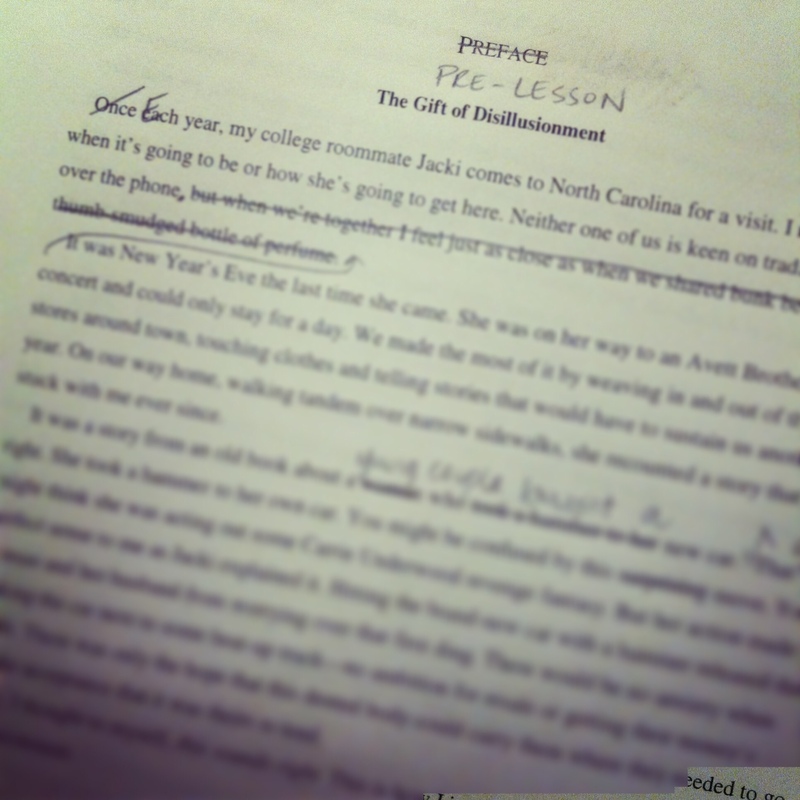 Then, not six weeks after I’d gone on my vacation from toil, I got the copy edits in the mail. The package was resting up against our door when I went outside to sniff the air last Monday. I held it my hands. Nervous. Excited. Reverent. Closing the door behind me, I came back inside and put it on the coffee table where it stayed all week. “I’m not ready for you, yet,” I told it on Wednesday. “I’m having so much fun. Can you wait until Friday?” A worm’s-length worth of dread was beginning to twist knots in my stomach. In The War of Art, Steven Pressfield personifies this kind of creative attack as Resistance. It shouldn’t surprise us that it often comes directly after bold statements of purpose, passion, or joy. In fact, it shouldn’t surprise us that upon meeting Resistance the task we once named an “easy yoke” becomes anything but fun. Fun, after all, is why the amateur creates, Pressfield writes. Resistance sees no threat from the amateur. The pro, however, writes because she can’t not. Words are as elemental to her as water. It is how she keeps herself alive and how she has any strength left to help others do the same. Her’s is a life and death calling. When writing stops being fun, we have the chance to go pro. Most days I pinch myself that I get paid to do what I love – and with so talented a team. But I’ve also been tempted to believe that this would all be more fun if it were just me in my pajamas with no one’s edits, no one’s deadlines, no one’s tracked changes. There are parts of the publishing process that have brought sheer delight – like getting to choose from three, slick cover options or getting to fill out an author Q&A like I was some guest on a talk show. There are also parts that require a jumbo-sized Blow Pop. When Jesus said, “Take my yoke upon you, and learn from me,” he gave us some clues as to what that might look like, namely, to do our work with gratitude and humility and in partnership. To be yoked with Jesus, as a novice ox would be yoked with a more experienced one, doesn’t mean we are excused from all work. Our bodies keep moving forward in faith by showing up, opening packages, and sitting down again to do the work that we can’t not do. But by taking the “easy part” of action not outcome, Jesus promises rest for our stressed-out souls. Even when the work stops being fun, we have the chance of going yoked with a pro. Oh, I love this Erin. Thank you for reminding me that being a writer doesn’t always have to feel good, even when it is (and how much I love The War of Art). This is an insightful perspective. Go Pro, Erin! You’re already are. 😉 I found a lot of inspiration from Pressfield’s the War of Art – has a prominent spot on my desk.